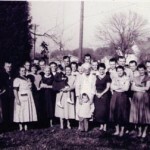 Mary Ford – my 2nd great grandmother was first generation in the US. Her father Frederick Ford (Voth) and possibly her mother Julia Smith immigrated from Germany – though some of the records list Julia Smith as coming from Iowa? Mary was then married three times to William Calvin Eldridge, Sheldon Cannon and Samuel Reese. She had two children William Lincoln Eldridge and Sarah Reese. Mary Ford was born on March 24, 1835, in Cincinnati, Ohio, the daughter of Julia and Frederik. She was married three times and had one son and one daughter. She died on February 20, 1923, in Oakwood, Illinois, at the age of 87, and was buried in Catlin, Illinois. William Calvin Eldridge and William Lincoln Eldridge ended up living across from each other on the farm where we currently live. – According to my aunt with twin houses! Mary’s husband William was a Mormon from Nashville TN according to family stories. Mary Ford’s daughter through her third husband Samuel Reese was Sarah Reese. Sarah married a Fithian and then a Kinsey. After marrying a Kinsey they relocated to California. 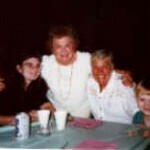 My grandmother remembered her aunt Sarah and when Sarah passed away, my grandmother received a small inheritance. The inheritance was used to replace my Aunt Linda’s bedroom with a bathroom – and add indoor plumbing to the house my grandmother and grandfather Richter had ended up in. 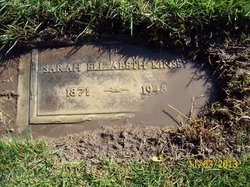 Sarah Elizabeth Reese Kinsey passed away in 1948 (my aunt was 6) and is buried in Glen Abbey Memorial Park in San Diego, California. 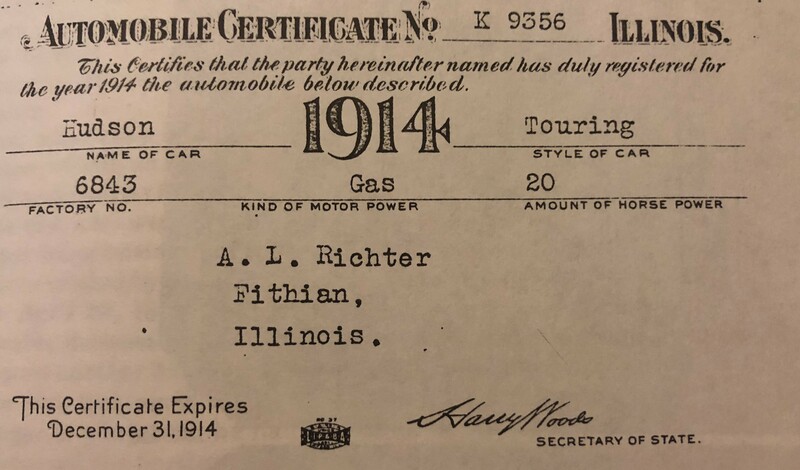 One of my ancestors, Abraham Lincoln Richter (1864-1944), had one of the first cars in the area. 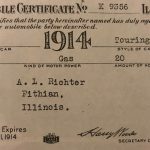 Abraham Richter was on the school board for Lake Shore school and owned land on the west side of Oakwood near where we live now. Houses at that time were few and far between, and trips in to town were fairly rare events that got documented in the paper in many cases. 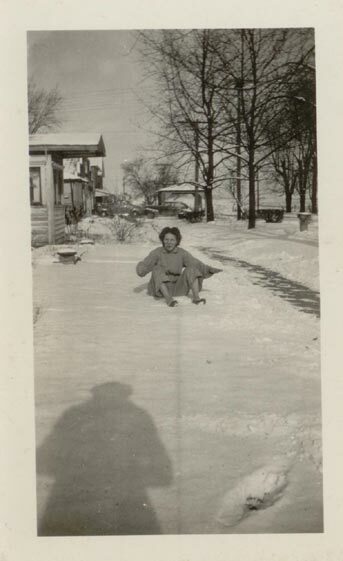 My grandmother Mildred Eldridge, married to Abraham Richter’s son Wesley Richter had only just started to learn to drive when she passed away in her fifties. While learning to drive, she was taking a trip to Champaign for shopping with my aunts and father and was involved in an accident. That was really the last time she drove. She was later diagnosed with cancer, but she hadn’t ventured out to drive again after the accident before her illness. 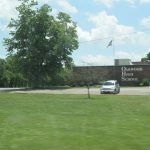 – The accident was along route 150 near the location that route 49 turns north. While a teenager my dad’s first accident was wrecking a motorcycle on our road. It was pretty amazing he survived at the time. Without my grandmother still living, my father had to go stay with my Aunt Dorothy after being released to have care. Near the end when he would have brain scans, the doctors would mention the scar tissue from the accident. The year I was born he flipped a corvette totaling it. He loved to race and it had been modified for racing. My mother was pregnant with me and my father was with two of my cousins at the time. While at the hospital the nurses and doctor, came out assuming that my dad was running around with two young girls (not knowing they were nieces) and mentioned that they didn’t think they could keep the story from the paper. He also lost the front end of his car just a few yards from where we are living now. The country roads tend to lend themselves to driving fast. Speed limits of 55 mph, houses miles apart, and very little traffic. 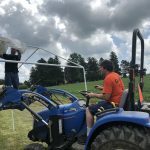 Though Vermilion county itself was actually the first county in the nation to pass a bond to build a set of roads for farm to market. The movement began in 1913 to raise money for the roads – two million dollar bond issue. The road near us was labeled route 10 but became the current route 150. Growing up my parents always made sure we had motor vehicles of all types. We learned to drive really early, practiced often, and could drive just about anything and anywhere. To start we had go-carts, including one my dad had modified for me that used a drill for a motor that ran with an extension cord. He would unplug it at any point if he felt that I was in danger – which on a farm took a lot. 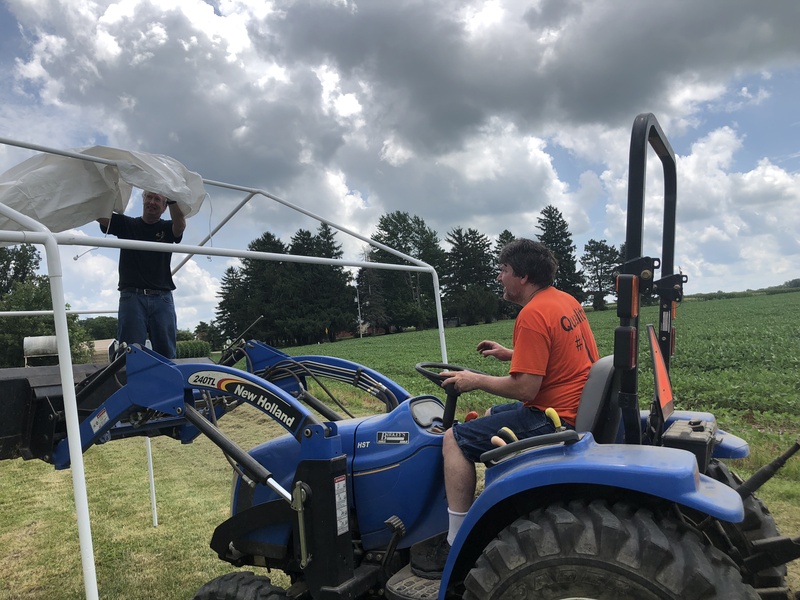 My dad moved on to two seat dune buggy’s in fiberglass, our own race tracks each year, snow mobiles, old cars, trucks, and whatever else he could find to let us try. By the time I was 16 I already was regularly driving a ram charger that was for me to drive. I remember the night of my 16th birthday right after going to get my license, I drove into town to babysit. We are still keeping costs as low as we can, but of course unexpected costs showed up. Things that the builder didn’t mention – I wish I could say they were small – and a couple smaller things that we really wanted added. The home arrived without wastewater plumbing, so we added that, we have an aeration tank for the septic, so that will have a yearly maintenance fee (but it’s a lot cleaner for the environment if maintained), we added lights under the house (a really nice extra), and are adding an outlet in the attic space (also a great addition)… Running the gas lines wasn’t included either, and that was more than we thought… I think we are on track with the rest. The house is behind schedule and seems to have received the wrong siding – I’m not sure how that happened, but looking through it seems fairly well built. There are a few places cabinet trim pulled away, one cracked tile, and cracks in the drywall, besides some jammed doors and space open above doors – but none are major things. I expect they will have everything fixed quickly now that they are working on site. The house even has a floor already laid in the attic, so we can start storing things there without having to take time to lay a floor first. Our new home was to be ready for the fourth of July, but plans went off somewhere and we ended up four to six weeks behind. After everyone was invited to our house, it was easier to move the party to the pond behind my mothers. To get ready, canopies, a grill, cooler, and some chairs were all set out. I can’t say it was quite the same as the parties we had as kids, but it definitely was a family gathering with lots of family and friends! 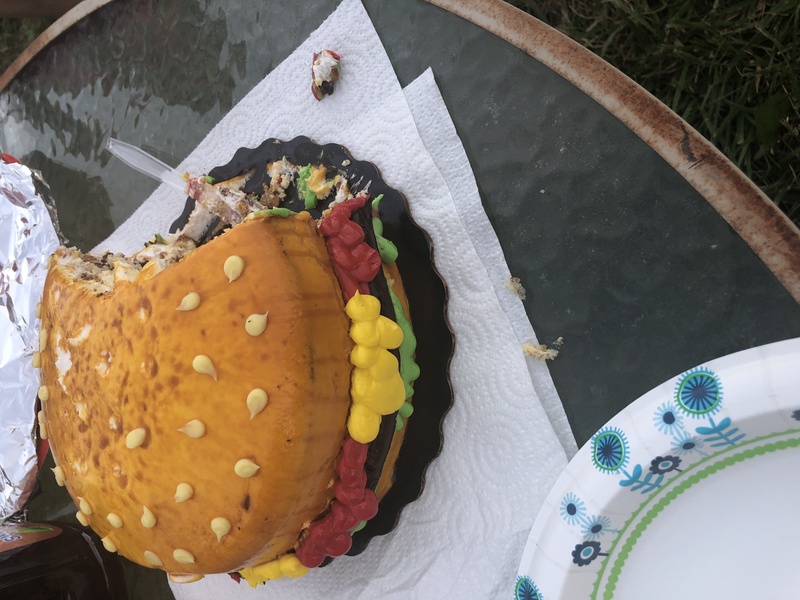 Dad always enjoyed fourth of July, so the canon was shot off in his memory as well as a cake decorated to look like a hamburger. With the dementia and strokes that dad had faced at the end, he had reached the point by my parents 50th anniversary that dad couldn’t eat solid foods – even liquids had to be thickened to keep him from choking. His favorite thing had been hamburgers and Pepsi. 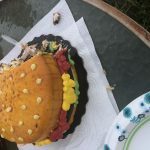 We hadn’t yet been told his diet had been swapped at the time, so for his anniversary we brought in a hamburger and Pepsi for dad. I think it was his last hamburger and Pepsi (that was thickened liquid). It was also a day shared with a large gathering of family. Rob and I are still learning how to load and light the canon, so it took three tries for it to go off. (This time Rob did all the work with the help of friends!) The canon has really been around, shot off everywhere from my cousin’s house, our house, and even The Little Nugget in Danville! After the canon was stolen last year, at one point we thought it would never happen that we would get a chance to shoot it off again. So lucky to have strong role models! On both sides of my family I’ve had women that were pretty amazing as role models. Some are still around and others are just in my family history, but had an effect on the formation of who I am. 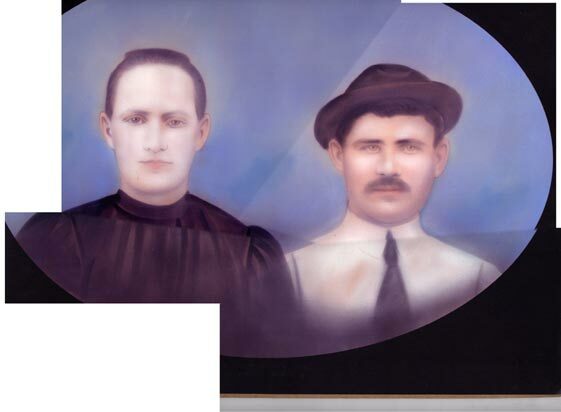 If you divide my family into my four grandparents, you will find that 75% have descended from ancestors that came to the United States before the Revolution. That last 25% was my grandmother’s family that came over from Italy in the early 1900’s. 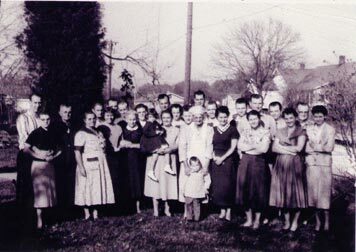 My grandmother was the last of nine children with the first three being born in Italy and coming over with just my great grandmother to follow her husband as he came to the Clinton IN and Belgiumtown IL, joining a cousin and finding work in a coal mine. My great grandfather came over first leaving his wife to come on a ship with three very young girls over to the US. At that point the trip involved bringing everything you wanted to keep in a chest and staying in a small area for a long time with a lot of other people, in the bottom part of the ship. Then arriving at Ellis Island, where if you (and the kids) had managed to remain healthy, you were quarantined in dormitories until you were cleared to leave the island. 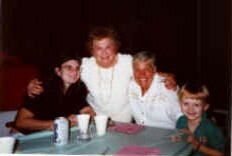 My family then went on to Clinton Indiana where one of the girls passed away. Over time they lost two girls out of all their children, one even having the same name as my grandmother. My great grandfather worked in a coal mine, and the boys went on to join him as they became old enough. My grandmother being the youngest was the only child that managed to go to high school. My great grandmother thought that she wasn’t as healthy as the others and would end up needing to work in some field that didn’t involve as intensive work… My grandmother at one point said she had wanted to be a nurse. The kids all pulled money together and grandma made it to high school. She borrowed books and studied as much as she could, going on to be a school teacher at the point when a college degree wasn’t necessary. 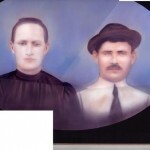 My great grandfather had passed away when my grandmother was only two from the flu of 1918. He was in the process of applying for citizenship at the time, so the paperwork didn’t get completed. I’m not sure when my aunt’s finished their paperwork, but my great grandmother didn’t apply until shortly before her death in the 60s. She lived simply in a small house in Belgiumtown Illinois, grew her own food, and cleaned houses for the coal miners in the area. Most of my aunts and uncles lived nearby – within just a few blocks. When my mother’s father drowned while my mother was only about 3, my grandmother and mother moved in with my great grandmother. When my grandparents married my grandmother had to quit teaching since women teachers were not allowed to be married at that time. (It seems crazy now to think about the restrictions they faced!) My grandmother went on to do several things to keep my mother and herself fed and clothed until she met her second husband. Even having never met my great grandmother I can say she was pretty amazing. Traveling to a new country with three young kids by herself, not knowing the language, then raising the kids including suffering the loss of two of her children – and then the loss of her husband, and keeping everyone fed and clothed is pretty amazing. Part of the time this occurred was during WWI and WWII when Italians weren’t high on the list of favorite people in the United States. I remember one day coming home to tell my grandmother a new joke someone had told me that involved Italians. I had no clue what the term Daigo meant, I’m not even sure the kid that told me the joke knew what it meant. But my grandmother knew! My grandmother could swear up a storm, but that was one word I learned not to ever repeat again. There were others, things kids called them in school, but that one was my first experience with what my grandmother faced growing up. My grandmother when first married had lived in a little shack, using a drawer for my mother to sleep in. My grandfather worked a coal mine with his brothers – my grandmother’s brother built the shack if I remember right. I’ve written about the stories from when my grandmother met her second husband, and remarried. Like my great grandmother she originally avoided getting remarried. There are so many things I learned from my grandmother, and so much more I could have learned from her. All my grandmother’s (and aunts) have served through time as strong role models. I’ve been seeing a story about an isolation room in a classroom in Loudin County that was captured by a special needs students iPad. It’s not the school we are looking at moving to – not even close, but seeing things like that is pretty scary when you are in a really good school and you are moving to a new school. Seeing this story always reminds me of a boy that was in my 5th grade class – in the 70s, really he was in my K- 8 at least…. The teacher actually took tall bookcases and made a cage for him and put them around his desk at the back of the classroom. I don’t think it went on for several weeks, but I remember it going on for a little while…. The teacher finally made a deal with the student that he could goof off for a short time each day if he behaved the rest as something they both could live with. So I remember the first day of the ‘truce’ being the boy wheeling the teacher’s chair up and down the rows of desks and singing Row Row Row my boat… Thinking back I wonder what the parents would have thought of what was going on in our classroom. I know my mother tried to get that teacher elected when he ran for office years later, ‘to get him out of the classroom’… but I’m fairly certain that had to do with all the other years. For me I remember that particular teacher as helping with a few things I needed help with. I was ahead in math in 5th grade and he let me work ahead, which really meant in 6th grade when I had to go back to material I already knew I pretty much gave up on math. 5th grade was the year I learned how to do 8th grade math, binary arithmetic and really enjoyed math. He was also our science teacher for 6th grade and when he caught my best friend, Iva and I with a dictionary we had made with our own secret language – he gave us time during class to work on it. So I have to admit I have good and bad memories from growing up in a small town school as the geeky misfit kid. So is it best to move to a small town where every knows each other and there is more chance for the teachers to know everyone. That same environment also means though that the small cliques that form tend to be more lifetime cliques. I’ve only seen the larger schools through each of my children’s experiences. For high school the large school battled us on everything from not allowing our exchange student attend to not allowing a schedule change mistake to be fixed until the second week because they were too busy with the freshmen. Then there was the year my oldest had class in the cafeteria which also met in the entryway of the high school at one point. He and two other students got forgotten for a special freshman award their freshman year because they were advanced and placed in with the upper classroom during the time period that the other students were pulled out for the award. We’ve also had them accidently schedule kids for the classes and their pre-reqs for their same semester, and even better, send truancy notices for not sending letters explaining that we were called to pick them up from school when they got sick and had to sign them out of the high school. The grade school I attended is no longer open, it was actually two buildings spread over two towns. 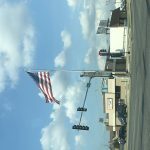 Muncie Fithian…. Muncie is now considered unsafe and is used for storage, Fithian is used for a private home. 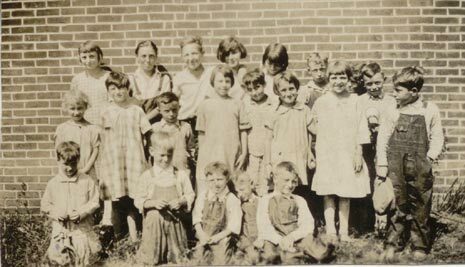 At Muncie my cousin Olive Richter was the aid to the 1st grade teacher, my cousin Charlie Mitchill was the principal for the first two years, and my cousin Randy was the janitor. At Fithian, my Aunt Ethel was in the office! It was great seeing my aunt everyday. I also would take the bus over to Muncie and participate in things at the church at Muncie Baptist despite not being a congregation member myself and being Catholic, they always let me participate (bible school and choir)… I would practice after school with the choir and then my cousin Olive would drive me home. 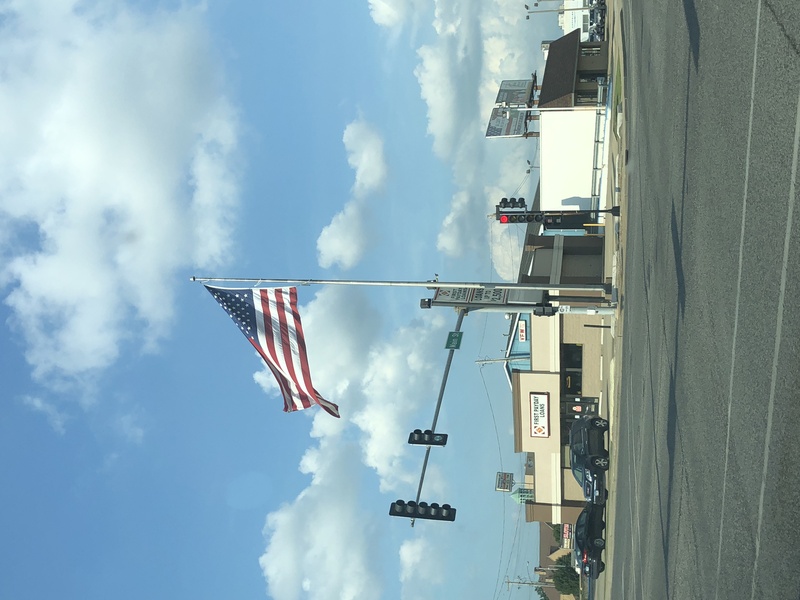 I remember getting the chance to walk from Muncie school to the church with Iva and enjoying the freedom of wandering the town – and with Muncie that is pretty much the entire town. Moving to Oakwood, we will be going to the new school, but right around the corner is the ‘new’ ice cream shop and a library. I can already picture school pick up next year involving a chance to stop at the library and then get ice cream on the way home before fixing dinner. The ice cream shop has pizza too! I forsee a lot of pizza dinner nights in our future. Time to go sledding! It finally snowed here! Time to go sledding. 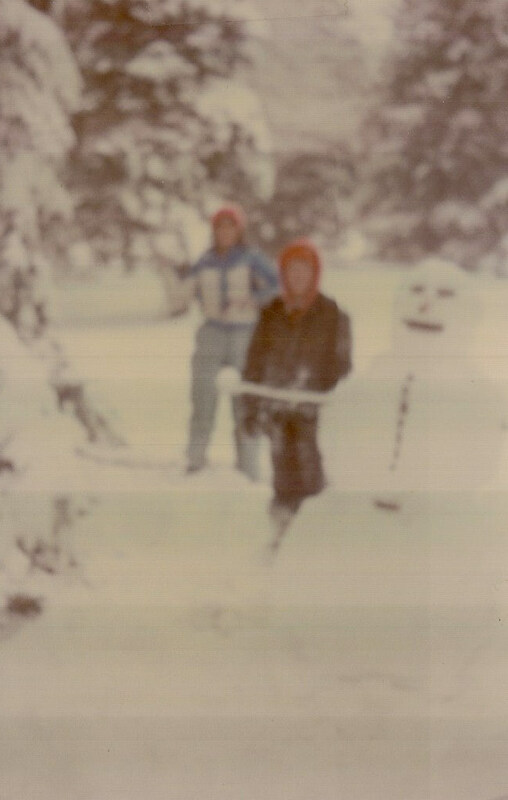 Growing up we had a lot more snow than we have here in Kentucky. I remember playing on snow mobiles, riding on the river, going on trips through the woods from house to house. Friends would show up on snow mobiles and we would hop on ours and join the caravan. 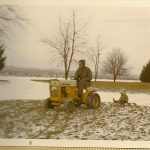 My dad would also take the tractor and plow our driveway, making a huge snow pile for us in the yard. My brother and I would spend hours making snow tunnels through the piles. The tunnels would be a few feet long and perfect for sliding down over and over. We would make igloos out in the yard and carry out our supplies to hang out in the yard, then spend the day playing outside. Snow would drift against all the fence rows and pile up to be several feet high. I remember riding snow mobiles across the tops, above the fields – and that one time we hit the gap in the snow. My mother was driving and I was riding and off we went into the air. Nothing… I still keep saying we were lucky to have survived childhood. We would ride up hills that I would now swear were at a 90 degree angle to the ground but surely weren’t completely 90 degrees, riding across rivers, with my dad’s instructions to not stop since it wasn’t frozen solid (go fast! 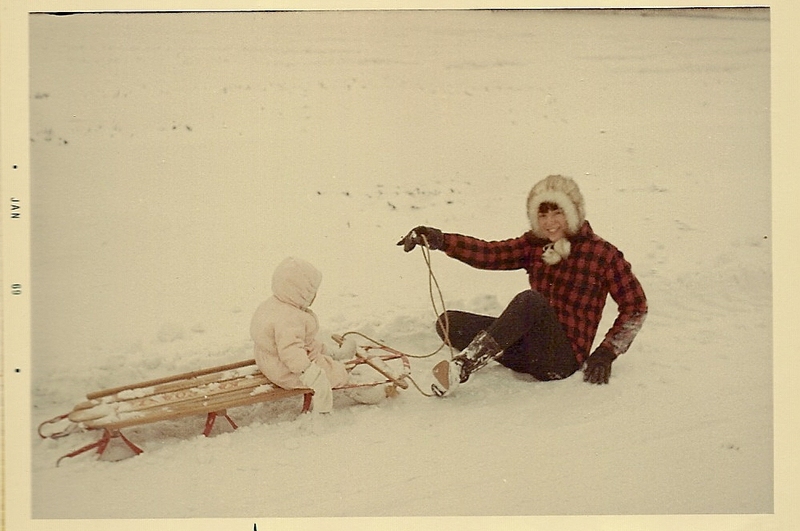 ), and of course we each had our own snow mobiles. My father’s snow mobile was an el Tigre that had been modified to race. it was rare for my parents to let us ride it…. Mine was an arctic cat and so pretty! I loved it, and I had the full snow suit with helmet, pants, snow boots, you name it. It was our regular outfits for the winter and when not on us you put it on the earth stove to dry. Of course one of the most important things to remember was to pee first. If you didn’t you had to hold it for a long time. We would go out and ride for hours. 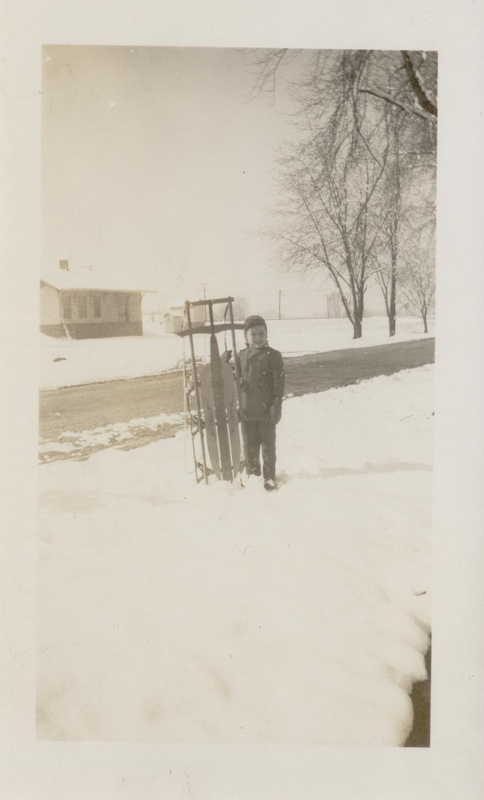 I kind of remember sleds being pulled behind snow mobiles, but it was more common years earlier to pull the sleds behind the mower. 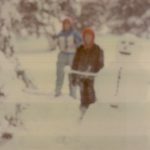 Snow in the country also meant power outages, so we would use the wood stoves, wood furnaces, fireplaces, and kerosene lamps. Toilets had to be flushed with whatever water was available and there was no way to wash up…. Well’s don’t work without power. But I don’t remember it being that bad, though I do remember times when the power went out for a week or more at a time. 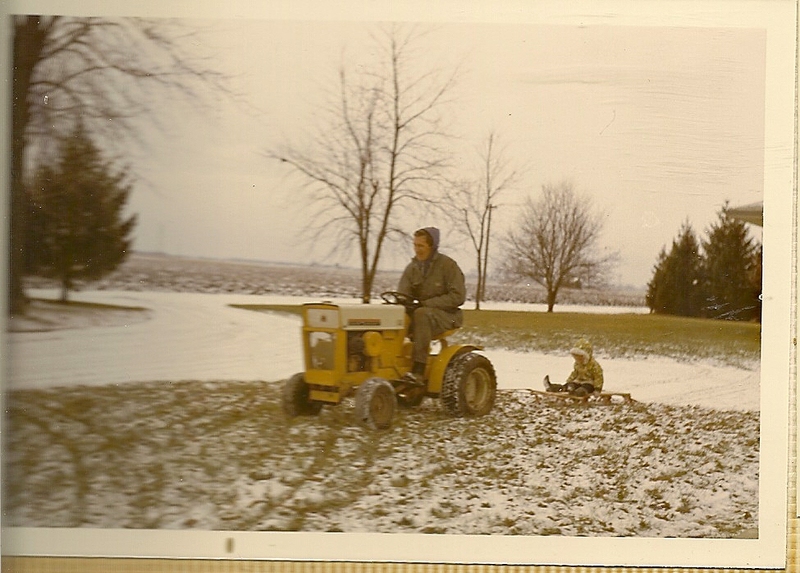 While we were playing outside, my dad would either join us or work around the farm moving snow with tractors. 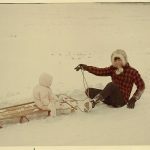 Sometimes dad would end up having to tow people out of the ditch. Dad was the go to person for anyone in the area being stuck in a ditch… surprisingly this meant we had a liquor closet completely stocked (although I don’t remember my dad drinking much). A lot of the that liquor is still in the closet. 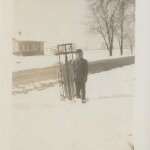 Dad would take his tractor and drive to wherever he was needed and pull the car, truck or whatever out of the ditch. I still love the thought of sitting in the corner of the kitchen by the earth stove during the winter, reading a book! I’m sure I still have a scar on my arm where I touched the stove and got a burn once too often, but I loved that corner of the kitchen. I’ve tried sitting on the floor in front of our fireplace with a book in our house, but it just doesn’t have that cozy feel of the corner behind the wood stove.